Introduction Resistance training (RT) and nutritional supplementation seem to have beneficial effects on muscle properties and physical performance in older adults. However, the reported effects of specific RT programmes and supplementation prescriptions vary among studies. The present study aims to examine the acute and residual effects of RT and/or beta-hydroxy-beta-methylbutyrate (HMB) supplementation on muscle mass, muscle strength and physical performance in older women with reduced muscle mass. Methods and analysis This is a randomised, double-blind, placebo-controlled trial. Older women fitting the eligibility criteria were recruited in February 2018 from a population-based sample identified via screening conducted in October 2017. In March 2018, 156 participants were randomly allocated to undergo one of four interventions (RT + HMB, RT + placebo, education + HMB and education + placebo) for 12 weeks. Supervised RT consisted of body weight, elastic band, ankle weight and machine-based exercises two times per week at the Tokyo Metropolitan Institute of Gerontology (TMIG). Each participant ingested HMB (1200 mg) or placebo supplements once daily. Sessions of education not associated with sarcopenia treatment were conducted every 2 weeks. Post-intervention follow-up will be conducted for 12 weeks, until September 2018. The study includes assessments conducted in March (baseline), June (post-intervention) and September 2018 (follow-up). The primary outcome is the longitudinal change in muscle mass. Secondary outcomes include the longitudinal changes in muscle strength, physical performance, muscle thickness, muscle quality, blood counts, blood biochemistry, calf circumference, skin viscoelasticity, habitual dietary intake, habitual physical activity levels, functional capacity and health-related quality of life. Intention-to-treat analyses will be conducted. Ethics and dissemination The study protocol was approved by the Ethics Committee of the TMIG, Japan. The study is being conducted according to the principles of the Declaration of Helsinki. The findings will be presented at international academic congresses and published in peer-reviewed international journals. Trial registration number UMIN000028560; Post-results. To the best of our knowledge, this will be the first four-arm trial to examine the effects of resistance training (RT) and/or beta-hydroxy-beta-methylbutyrate supplementation among older adults with reduced muscle mass. The study will collect information about the residual effects of the intervention over an observation period of 12 weeks. The trial has a randomised, double-blind, placebo-controlled design, which supports the generalisability of the findings and minimises the risk of selection, performance and detection bias. In addition to machine-based exercises, the participants will also perform RT using body weight, ankle weights and elastic bands, which will not provide objective information regarding muscle loading but which represents a more suitable prescription for older adults and a more feasible exercise routine to be performed on a daily basis. All participants will be older women, which limits generalisation of the findings to men. Sarcopenia is a syndrome characterised by progressive and generalised loss of skeletal muscle mass and strength.1 In older adults, sarcopenia is associated with adverse health outcomes such as increased risk of incident falls,2 reduced performance in instrumental or basic activities of daily living, hospitalisation, institutionalisation and mortality.3 4 To reduce the social burden of sarcopenia, it is important to develop prevention and treatment programmes aimed to extend healthy life expectancy, especially in older people with high risk of sarcopenia. The present study aims to examine the acute and residual effects of RT and/or HMB supplementation on muscle mass, muscle strength and physical performance in older women with reduced muscle mass. We hypothesised that, compared with RT alone, HMB supplementation alone and placebo, combined RT and HMB supplementation would provide higher benefit in terms of improving and maintaining muscle mass, muscle strength and physical performance. These findings will provide new evidence regarding the effectiveness of nonpharmaceutical interventions for sarcopenia and will be useful in the development of sarcopenia prevention and treatment programmes in physically frail populations. Older women fitting the eligibility criteria were recruited in February 2018, from among a population-based sample identified via a screening conducted in October 2017. After recruitment, a four-arm intervention was conducted between March and June 2018. The participants will be followed until September 2018 to observe the residual effects of the intervention. After the observation period, all interventions will be available to all participants, in agreement with ethical principles. Amendments to the protocol will be disclosed on the UMIN-CTR page of the trial. The study involves assessments conducted in March (baseline), June (post-intervention) and September 2018 (follow-up). Before the baseline assessment, all participants received written and oral information from the researchers (YO, NK and KH) regarding the study purpose, procedures, confidentiality of personal information, possible benefits, possible risks and coping strategy for the risks. Only participants who provided written informed consent proceeded within the trial. The flow chart of the study is shown in figure 1. 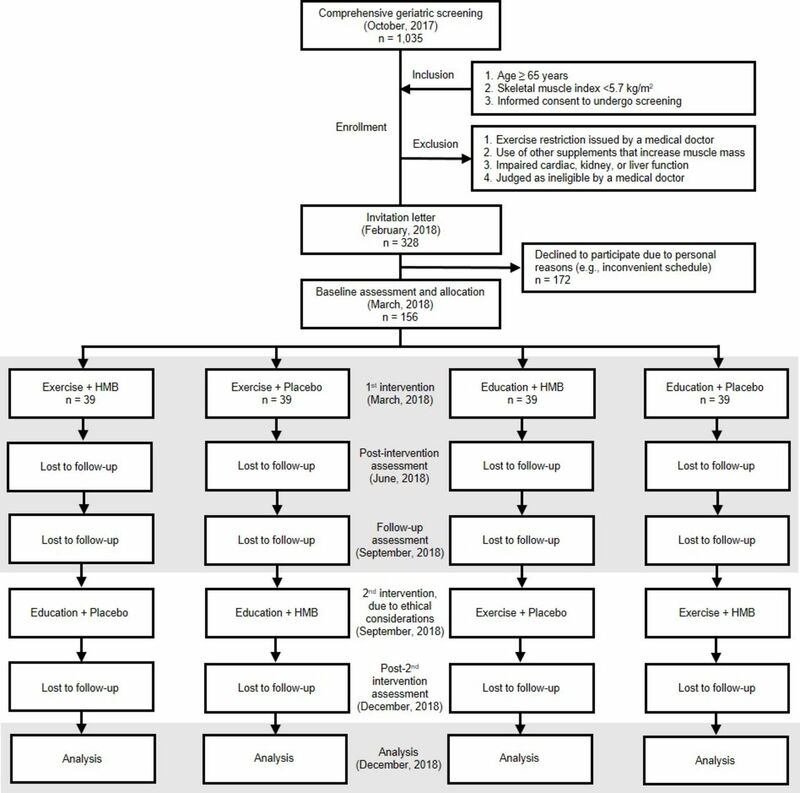 Study flow chart covering participant recruitment and enrolment, group allocation, intervention, observation and data analysis. A second intervention will be provided after the follow-up assessment, in agreement with ethical principles. However, only data from the highlighted fields will be included in the analysis. HMB, beta-hydroxy-beta-methylbutyrate. To select the study sample, a population-based comprehensive geriatric survey was conducted as a screening assessment at the TMIG in October 2017. Invitation letters for the screening assessment were sent to 6366 subjects randomly selected from the Basic Resident Register of the Itabashi ward, which is a special ward located in the northwest area of Tokyo. In total, 1035 older women participated in the screening assessment. The inclusion criteria of this study were as follows: (1) age ≥65 years; (2) reduced muscle mass, defined as a skeletal muscle index <5.7 kg/m2, per the sarcopenia diagnosis consensus issued by the Asian Working Group for Sarcopenia16 and (3) informed consent for undergoing screening. The exclusion criteria were as follows: (1) exercise restriction issued by a medical doctor; (2) use of other supplements known to increase muscle mass; (3) impaired cardiac, kidney or liver function and (4) judged as ineligible by a medical doctor. A sample of 328 women fitting the eligibility criteria received invitation letters regarding the study intervention, of whom 156 participated in the baseline assessment, whereas the remaining 172 declined to participate due to personal reasons. A baseline assessment was conducted in March 2018. Afterwards, the participants were randomly allocated to four groups in a ratio of 1:1:1:1 based on a computer-generated randomisation number. The allocation was conducted by two researchers from the University of Tsukuba (KW and KT). The allocation keys will be blinded from the researchers at the TMIG (YO, NK and HK), participants, exercise trainer, analysists and assessors until December 2018 in order to maintain allocation concealment. The researchers holding the allocation keys will not have contact with the participants. During the intervention and observational periods, all participants were instructed not to change their habitual dietary intake or physical activity levels. All participants were instructed to ingest active (calcium HMB) or placebo products provided by Kyowa, Tokyo, Japan. The active products contain 30 mg of protein, 20 mg of fat, 3500 mg of carbohydrates, 0.2 mg of sodium, 207 mg of calcium and 1200 mg of HMB. Placebo products do not include calcium or HMB, and the missing amounts are provided as carbohydrates. Both products are provided in powder form with the same flavour, appearance and package. The two researchers (KW and KT) maintaining the allocation keys labelled the package with an identification code and sent the products to the researchers at the TMIG (YO, NK and HK). The participants received the blinded product, which they were instructed to mix with 200 mL of water and ingest once a day after any meal. The participants were instructed to record the ingestion of products in a diary. Participants allocated to the health education groups took part in six 60 min sessions (once every 2 weeks for 12 weeks) of health education not related to sarcopenia prevention but focused specifically on dementia prevention, prevention of bank transfer fraud, music therapy, nutrition and general health, oral care and social education, each given at the TMIG by an expert in that field. This study includes assessments conducted in March (baseline), June (post-intervention) and September 2018 (follow-up) at the TMIG. All assessors are TMIG employees who are not researchers and are blinded to group allocation. Peak isometric knee extensor strength in the dominant leg is measured in a sitting position. The assessor places the hand-held dynamometer (µTas F-1; ANIMA, Tokyo, Japan) on the skin above the anterior ankle, at a level 5 cm above the tip of the lateral malleolus. The participants are instructed to extend the knee with maximum power starting from a knee joint angle of 90°.27 After a few practice repetitions, the participants are measured twice, and the best result is retained. Peak isometric hip adduction strength is also measured in a sitting position. The assessor places the hand-held dynamometer (µTas F-1; ANIMA) at 3 cm proximal to the medial knee fissure and instructs the participant to exert maximal hip adduction force while compressing a 12 cm rod equipped with a dynamometer, keeping both knee joints at 90°.28 After a few practice repetitions, the participants are measured twice, and the best result is retained. Handgrip strength is measured using a hand-held Smedley-type dynamometer. The participants are instructed to stand naturally, grip the device with their dominant hand and squeeze as hard as possible.29 The best result of two trials is retained. Using a stopwatch, the usual and maximal gait speed are measured as the time taken to walk 5 m (between markers set at 3 m and 8 m of an 11 m walking path)29 at the usual or maximal speed, respectively. Usual gait speed is measured once. Maximal gait speed is measured twice, and the best result is retained. This test measures the time taken to stand up from the chair, walk to and around a marker placed 3 m away, return to the chair and sit back down.30 The participants are instructed to perform these movements as quickly as possible. The test is performed twice, and the best result is retained. This test measures the time taken to stand up from the chair until full knee and hip extension, sit back down, and repeat this movement five times as quickly as possible.31 The participants are instructed to fold their arms across the chest, stand-up completely and make firm contact when sitting. After a few practice repetitions, the test is performed twice, and the best result is retained. Blood samples are collected from the antecubital vein. Analyses are carried out centrally in one laboratory (Health Sciences Research Institute, Kanagawa, Japan). Enzymatic methods are used to determine creatinine, cholesterol (total, high-density lipoprotein, low-density lipoprotein), triglyceride, blood glucose and glycated haemoglobin levels. Reference methods recommended by the Japan Society of Clinical Chemistry are used to assess aspartate transaminase, alanine transaminase, lactate dehydrogenase and creatine kinase levels. Other assays include the urease method with glutamate dehydrogenase (for blood urea nitrogen), direct colorimetry (for Fe), flow cytometry (for white blood cells), erythrocyte fragility test (for red blood cells), sodium lauryl sulfate method (for haemoglobin), microhematocrit method (for haematocrit), latex agglutination turbidimetry (for cystatin C), nephelometric immunoassay (for high-sensitivity C-reactive protein), immunoradiometric assay (for insulin-like growth factor-1) and chemiluminescence immunoassay (for vitamin B12). The body mass index (kg/m2) is calculated as the body weight divided by the body height squared. Plastic tape is used to measure the calf circumference in the nondominant leg. Skin viscoelasticity is evaluated using the Cutometer dual MPA 580 (Courage +Khazaka electronic GmbH, Cologne, Germany), which measures the elasticity of the upper layer of the skin using negative pressure to induce mechanical deformation; such measurements are useful for quantitative evaluation of age-related changes in skin elasticity.34 35 The displacement of the skin at the aperture of the Cutometer probe is measured optically, and the resistance of the upper skin layer to the applied negative pressure and the ability to return to the original position are displayed as curves in real time. Skin viscoelasticity is assessed for the skin of the cheek. The participants are instructed to refrain from using makeup on the day of the assessment. The test is performed five times with 10 s intervals, and the average result is retained. Habitual dietary intake is measured using a brief-type self-administered diet history questionnaire, which has been validated for estimating the monthly energy intake and the intake of each nutrient factor in older adults.36 37 These calculations are performed exclusively using software provided by Gender Medical Research, Tokyo, Japan. Habitual physical activity levels are assessed using the International Physical Activity Questionnaire, which has good reliability and validity for estimating daily physical activity levels.38 39 We calculate total scores and the scores for each of the four physical activity domains (leisure time, domestic and gardening, occupational and transport-related physical activity). These evaluations are conducted to determine whether the participants changed their lifestyle patterns during the intervention period. Functional capacity is assessed in terms of the instrumental self-maintenance (five items), intellectual activities (four items) and social roles (four items) subscales of the TMIG index of competence. The validity and reliability of the face-to-face assessment of the TMIG index of competence have been demonstrated previously.40 Participants are asked whether or not they are able to perform the function described by each item, to which they may answer either ‘yes’ (able to do so, 1 point) or ‘no’ (unable to do so, 0 point), for a maximum total score of 13 points, with a higher score indicating better functional capacity. Health-related quality of life (HR-QoL) is assessed using the WHO-Five Well-Being Index, which has good validity for assessing mental condition in older adults and consists of five items representing mood in daily life over the preceding 2 weeks.41 The participants are instructed to rate the frequency of the mood from 0 (never) to 5 (all the time), for a maximum score of 25 points, with a higher score indicating better mental condition. Any RT- or supplement-related adverse events occurring during the intervention period are recorded. The affected participants are free to discontinue the trial or continue other interventions (ie, participants with HMB- or placebo-related side effects may continue to perform RT, whereas participants with RT-related injuries may continue to take HMB or placebo). We assess the adherence to the intervention, including RT participation rate and adherence to the daily use of the assigned supplement (based on the participants’ daily diary of study product intake). If a participant drops out from the programme, the reasons are recorded. The primary outcome measure is muscle mass. Secondary outcome measures include muscle strength, physical performance, muscle thickness, muscle quality, blood counts, blood biochemistry, calf circumference, skin viscoelasticity, habitual dietary intake, habitual physical activity levels, functional capacity and HR-QoL. To promote the collection of quality data, the collected data will be double-checked by the assessors, and a statistician will check the range of values. Between-group comparisons of baseline characteristics will be conducted using one-way analysis of variance (ANOVA) or the Kruskal-Wallis test for continuous variables, and the Χ 2 test for categorical variables. Continuous data will be expressed as mean and SD or median and IQR. Differences in longitudinal mean changes in main and secondary outcomes from baseline to post-intervention will form the primary focus of the analysis. Two-way ANOVA for the changes in outcomes will be applied to test for interactions between two factors (RT vs education and HMB vs placebo). The main effects of RT (RT + HMB and RT + placebo vs education + HMB and education + placebo) and HMB (RT + HMB and education + HMB vs RT + placebo and education + placebo) will also be tested. Within-group changes will be analysed using paired t-tests, whereas between-group differences in the change in outcomes will be compared using one-way ANOVA. The Scheffe method will be applied for relationships showing significance on one-way ANOVA. For subgroup analysis, the participants will be stratified according to sarcopenia status, as defined based on the Asian Working Group for Sarcopenia criteria. The intention-to-treat principle will be applied in all analyses. Missing data will be treated via multiple imputation, in which the Markov Chain Monte Carlo approach will be applied to generate 20 imputed data sets based on the baseline characteristics and the outcome variables. All statistical analyses will be performed using SPSS V. 25.0 (IBM Corp., Armonk, NY, USA). P Values <0.05 will be considered to indicate significance. This study will be conducted without participant involvement. Participants will not be invited to comment on the study design, will not be consulted to define relevant outcomes or interpret the results and will not be invited to contribute to the writing or editing of this paper for readability or accuracy. The study protocol was approved by the Ethics Committee of the TMIG and will be conducted in agreement with the Declaration of Helsinki. The findings of this study will be presented at international academic congresses and published in peer-reviewed international journals. On publication in a journal, we will also make the findings available on the TMIG homepage. This study addresses the paucity of data regarding the effects of RT and/or HMB supplementation in older women with reduced muscle mass, and the findings will provide insight regarding the potential synergistic effect of RT and HMB supplementation on muscle mass, muscle strength and physical performance. We will also examine the residual effects of such interventions over a 12-week observation period, as such findings may help understand the potential of nonpharmaceutical treatment for sarcopenia. Literature reports regarding the individual effect of HMB supplementation on muscle properties and physical performance in older people are encouraging.21 22 43 However, to our knowledge, only two studies have evaluated the combined effect of RT and HMB supplementation in older populations.14 15 Specifically, Vukovich et al enrolled 31 adults aged >70 years and reported significant muscle mass gain after 12 weeks of exercise with HMB supplementation but not after exercise with placebo (P for interaction, 0.08).14 On the other hand, Stout et al enrolled 36 adults aged >65 years and reported significant improvement in muscle quality, calculated as muscle strength relative to muscle mass, after 24 weeks of HMB supplementation alone (ie, no exercise).15 It remains unclear whether the combined programme provides higher benefits. These previous studies had a relatively small sample size, which might increase β-error; moreover, the participants were relatively healthy and had almost normal muscle mass, suggesting that they may have benefited less from HMB supplementation. As completely controlled groups were not previously included, the potential synergy between RT and HMB supplementation remains unclear. The present study will address these limitations and serve as the first investigation of the acute and residual, independent and combined effects of RT and HMB supplementation, which will be conducted in a larger sample of older adults with reduced muscle mass. The randomised, double-blind, placebo-controlled design will minimise the risk of selection, performance and detection bias, and will support the generalisability of the results. One limitation is that, in addition to machine-based RT, the intervention involves body weight, elastic band and ankle weight RT, which does not provide objective information regarding muscle loading; on the other hand, such RT programmes are more suitable for older adults and will be more feasible in daily practice. Another limitation is that all participants will be older women, which will preclude generalisation of our findings to men. We are grateful to the participants and the staff members of the Tokyo Metropolitan Institute of Gerontology.
. Validity and reliability of Japanese version of International Physical Activity Questionnaire. Journal of Health and Welfare Statistics 2002;49:1–9. Contributors YO and HK conceived the study, designed the study protocol, participated in the coordination of the study (recruitment and screening) and wrote the manuscript. NK participated in the coordination of the study and helped manage data collection. KW and TK contributed to designing the study protocol, conducted the randomisation and have been maintaining allocation concealment. DM contributed to designing the study protocol and negotiated a contract with the provider of the intervention products. All authors read and approved the final manuscript. HK is the principal investigator in this trial. Funding This study is financially supported by Kyowa Co., Ltd., Tokyo, Japan (no grant number) and is being conducted as a joint research effort of the Tokyo Metropolitan Institute of Gerontology, University of Tsukuba, and Kyowa Co., Ltd. Competing interests The intervention products (HMB and placebo supplements) were provided by Kyowa Co., Ltd. DM is employed by Kyowa Co., Ltd. The funder is not involved in subject recruitment, intervention, data collection, data analysis or preparation of the manuscript. Ethics approval Approved by the Ethics Committee of the Tokyo Metropolitan Institute of Gerontology on 15 September 2017.